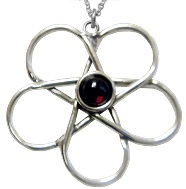 Widdershin's offers a collection of Sterling Silver Pentacles with Stones. Choose a metaphysical stone and feel their effects. View our list of Metaphysical Stone Properties. These beautiful Pentacles are individually made in America and may take up to 4 weeks before shipping. Shown with Onyx or choose stone. Pendant size: 3/4" x 5/8". Comes with an 18" Sterling Silver Cable Chain. 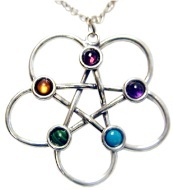 Sterling Silver Pentacle with Stone Pendant. Shown with Onyx or choose stone. Pendant size: �" x �". Comes with an 18" Sterling Silver Cable Chain. Shown with Garnet or choose stone. Stone size: 5mm Stone size: 5mm. It is shown with a white moonstone but the rainbow moonstone looks great also. Or something of your own choosing? Stone size: 6mm x 8mm. Shown with Amethyst or choose stone. Pendant size: 5/8" x �". Pendant size: 1�" x �". Pendant size: 1" x �". Shown with Moonstone or choose stone. Sterling Silver Pentagram on Half Moon with Stone Pendant. Pendant size: 1" x 1�". Pendant size: 1-9/16" x 1". Pendant size: 1�" x 1". One of the most detailed and beautiful dragons. A heavy piece, so you will want a larger chain. Shown with garnet, but as always, you may choose your stone. Pendant size: 2" x 1�". There are five basic "elemental energies" which are styles of perceiving and interacting with the world. Each of the energies (Earth, Fire, Water, Air, and Spirit) is associated with a particular way of perceiving and interacting with the world. Includes an 18" sterling silver cable chain.